The BLT – talk about an all-star, Pro-Sandwich Hall of Famer! Now add dairy in two lovely forms (cream cheese and sour cream), turn it into a dip, and we’ve got a serious football party! This recipe also includes one of our other favorite cooking words… easy! The only part that will slow you down is the shredding. Grab some already shredded cheese, a bag of shredded Iceberg and you’re good to go. Enlist the help of a chopper for the tomatoes, and you’ve got a dip that comes together in a matter of minutes. You could switch up the spices or the cheeses to your liking. Hey, it’s football season, call an audible. Without my boy P-Mann around this year, I’m more than making up for it in the kitchen! 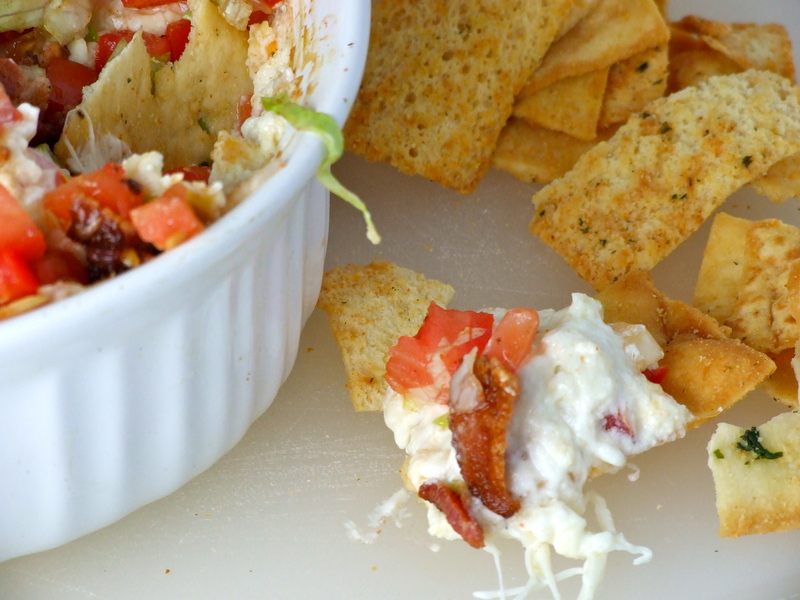 The crispness of the bacon and lettuce, matched with the fresh taste of tomatoes, and the creaminess of the cheese mixture is pure dip delight. It’s gotten to the point in my football season where nothing will comfort me, the losses are piling up, the injuries out of control… so food is gonna have to start doing the job… this dip answers the call! Set aside 1⁄2 cup crumbled bacon. In a large bowl, combine remaining bacon, cream cheese, shredded cheeses, sour cream, mayonnaise, Italian seasoning, garlic powder, salt, pepper, and Dijon mustard. Spoon mixture into prepared baking dish. Bake for 25 to 30 minutes or until hot and bubbly. 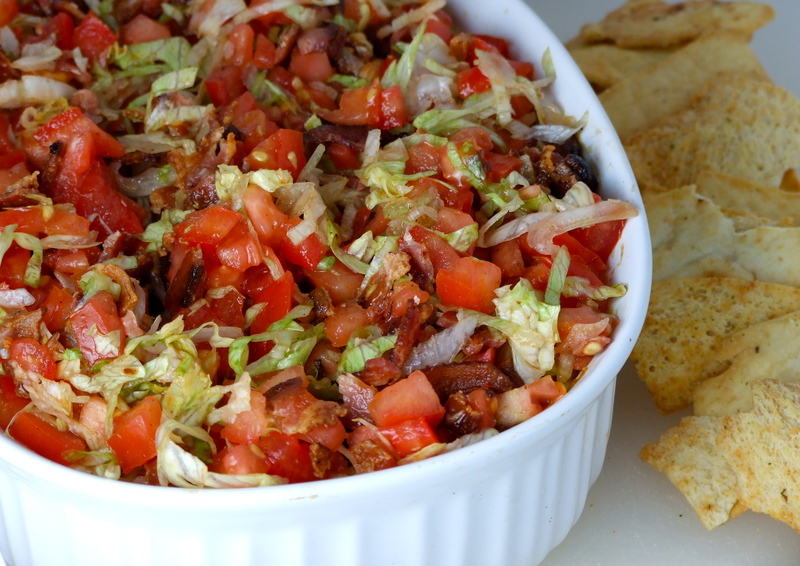 Sprinkle chopped tomatoes, remaining 1⁄2 cup crumbled bacon, and Iceberg lettuce over hot dip. Serve immediately with toasted bread rounds, crackers, or pita chips. Slightly adapted from The Dean Brothers. Nice! I’ve made a Cobb Salad dip before that was delicious and I feel like this is a sort of similar concept…can’t wait to try it! Made this for a babyshower I was hosting and it was a HIT…quick, easy, and fairly cheap to make. I served it with a toasted french baguette. What is Fontina cheese? Is there any substitution? Fontina is an Italian cow’s milk cheese with a pretty aggressive flavor profile. It’s nutty, earthy, and rich. A hard provolone, gouda, or mild gruyere would work as a substitute. Could this recipe be changed out with low fat or fat free ingredients? Absolutely, across the board on all the dairy ingredients. Sounds like I need to try this soon!